November 19 – Appetizers will be served by Katie B. of Simply Food and Danielle of More Than Four Walls. November 26 – Shannon of Growing Slower will be creating a delicious salad to share with us. December 3 – What meal is complete without sides? You are in for a double treat with the dishes Jackie of LittleOwlChrunchyMomma and Virginia of George Town, MN are whipping up! December 10 – Chara of Stiching Hearts Together and I will be sharing two delightful homemade breads. 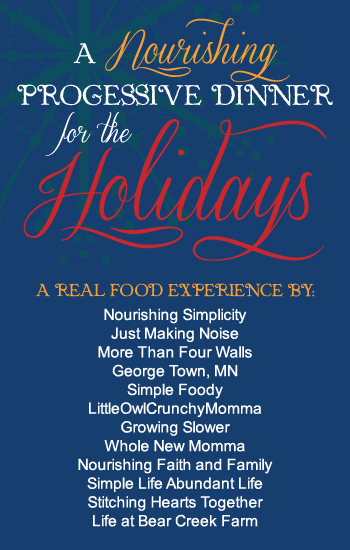 December 17 – Katie S. of Nourishing Simplicity will be sharing a main dish that has been a family favorite for years. December 24 – Pour yourself a couple of glasses of the festive beverages being served by Virginia of George Town, MN and Sherry of Nourishing Faith and Family. Come back here each week for updated links to each host’s contribution. We also want you to join us in the holiday fun. How does a real food recipe exchange sound? Each host will have a link-up live on her post where you can share your favorite holiday courses or grab some new recipes to try! Check out all the link ups here. This entry was posted in Deserts, Main Dishes, Mother's Kitchen, Snacks, Uncategorized and tagged apetizers, Christmas, deserts, dinner, holidays, main dishes, side dishes by Cery. Bookmark the permalink.